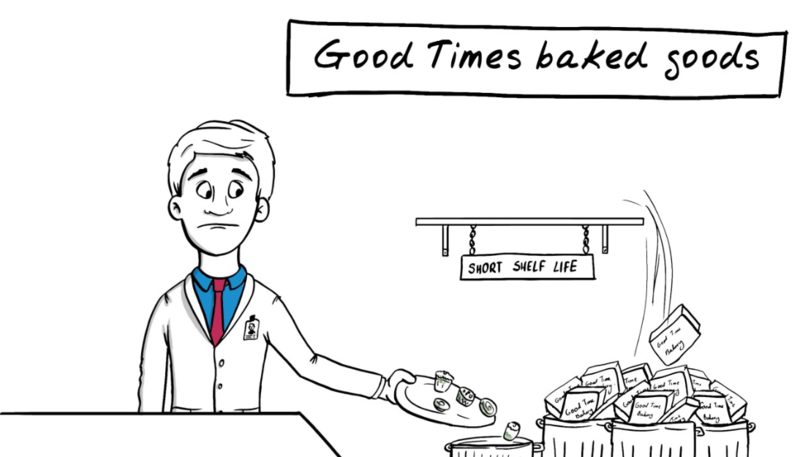 Walter is the quality control manager for “Good Times Baked Goods”, a leading pastry company. Recently, Walter has been receiving complaints about his famous cupcakes spoiling well before their expiration date. What is going on in Walter’s cupcakes? Mold seems to be growing quickly on Walter’s cupcakes as a result of high water activity levels. Water activity is the amount of unbound water present in the sample. In other words, some of the water molecules are chained to chemical groups in the product itself and are not available to move freely. Water which is not bound to the ingredients themselves can be used by unwanted microorganisms which could be one contributing factor to food spoilage. Water activity is based on a scale of 0 to 1.0, with pure water having a value of 1.00. It is defined as the vapor pressure of water over a sample divided by the vapor pressure of pure water at the same temperature. In other words, the more unbound water we have, the more likelihood we have of microbial spoilage. Unbound water will exert vapor pressure which can be used to determine microbial spoilage, chemical, and physical stability. In relation to cupcakes, a water activity measurement of 0.5 or lower would mean the likelihood of microbial growth is very low. In Walter’s cupcakes, which measured at 0.78aw, it appears too many water molecules are unbound facilitating mold growth. If Walter had a Novasina Water Activity Meter, he would have known that the water activity level in his cupcake is too high and he could adjust his recipe to avoid any spoilage. Walter’s Novasina Water Activity Meter is measuring the free water that can leave the product. It effectively detects this unbound water by measuring the equilibrium relative humidity over the surface. This value is then converted into a water activity measurement. Wait until the sample has reached stability. Measure at a consistent temperature so that you can compare values. Neutralize the influence of volatiles which can skew your results. Walter is now measuring the water activity of his products on a regular basis and adjusting his recipes and method to keep the water activity level under control. He has been able to extend the shelf life of his products by far. Novasina water activity meters are widely used in various industries such as food, pharma, personal care, and government agencies to help in prolonging the shelf life and to avoid unwanted chemical or physical changes to their products. For more information, and to purchase your Novasina Water Activity Meter, contact us today.